If you’re in the market for a new tablet right now and you don’t need a full-blown PC operating system, there are really only two tablet lines you should consider. One is Apple’s iPad line (but definitely don’t buy a high-end iPad Pro right now, since new models are coming next month), and the other is Amazon’s Fire tablet line. Where the latter is concerned, you’ll be happy to learn that the best deal in tablets is available on Amazon once again. 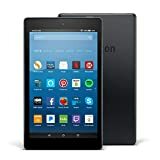 While supplies last, you can snag a Certified Refurbished Fire HD 8 Tablet with Alexa for only $49.99. In terms of value, it really doesn’t get any better!